For those suffering from a sluggish mind, or perhaps even a barely functioning short-term memory, you are most likely looking for relief in all corners of the web. During your web surfing, you most likely happened upon the world of nootropics. Nootropics are non-prescription supplements for the mind that aim to increase focus and provide relief from anxiety. Yet many nootropics may appear sketchy, and perhaps be even a little untrustworthy. If you’re looking for a company that appears to have an established base and history, we might just have the company for you. During our search for the ideal nootropic, we found Advanced Orthomolecular Research. This is a Canadian-based company appears to be directed by a respected medical physician and was established during the HIV crisis in the early 1990s. The company sells numerous products, provides a list of its accomplishments, a photo of its headquarters, ways customer service can be reached, and information for those interested in nootropics overall. 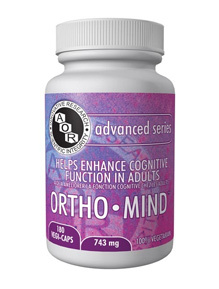 According to the website, Orthomind is a nootropic that provides cognitive support and helps reduce mental stress. The formula also contains antioxidants, and supplies general support for the body. The scientists behind Orthomind provided the exact amount of each ingredient, which is rare for nootropics. The first ingredient listed is R(+)-lipoid acid. Alpha-lipoic acid, as it’s more commonly known as, is an antioxidant. This antioxidant is found in liver, kidney, spinach, and other vegetables. It is also produced as a medicine, specifically for those with diabetes who are suffering from nerve pain, and also those suffering from memory loss. It appears that alpha-lipoic acid helps prevent cell damage and can help improve the function of neurons. Other ingredients in Orthomind include ginseng, which has been used for years in Asia to increase energy and reduce stress. Also included is bacopa, which is an herb from India that reduces anxiety and also allows you to think more clearly, and acetyl l-carnitine (ALCAR), which is an amino acid that encourages the production of energy in the mitochondria of cells. ALCAR is used to protect and improve muscular and vascular function. Citicoline is a brain chemical developed in Japan originally to treat stroke victims. It increases the brain chemical phosphatidylcholine, which is a chemical in the brain important for normal function. There is evidence that citicoline may also decrease brain tissue damage after an injury. So far Orthomind sounds like a pretty nice supplement, but are there any other special ingredients in Orthomind? One more ingredient in Orthomind is arginine pyroglutamate, which is a compound of arginine and pyroglutamate. Pyroglutamate is an amino acid that promotes blood flow and better oxygen delivery throughout the body. The combination of pyroglutamate and arginine is thought to boost memory recall and improve long-term memory also. However, when we researched arginine, we found out that our bodies might digest arginine as a human growth hormone, which we found a bit strange. We couldn’t find an explanation on the website as to why we would need to grow our arm muscles, as well as our brain muscles, so for now we can only remain cautious regarding this ingredient. The final ingredient in Orthomind is pantothenic acid, which is another name for vitamin B5. This vitamin is water-soluble and is an essential nutrient for the metabolising of proteins, carbohydrates, and fats. It is found in nearly every food consumed by humans and a deficiency in B5 is exceptionally rare. Why we would need more vitamin B5 is unknown to us, so it seems a bit unnecessary honestly. A month’s supply costs about $77 depending on which website you purchase the product from. This price is quite reasonable but there are definitely better supplements out there for a cheaper price. We were extremely excited about Orthomind in the beginning, but after digging a bit deeper, we became less sold. It wasn’t clear to us why certain ingredients were included, and why would we want to spend money on something unnecessary? However, if you want to just give it a whirl, go ahead. However, I wouldn’t expect wonders.